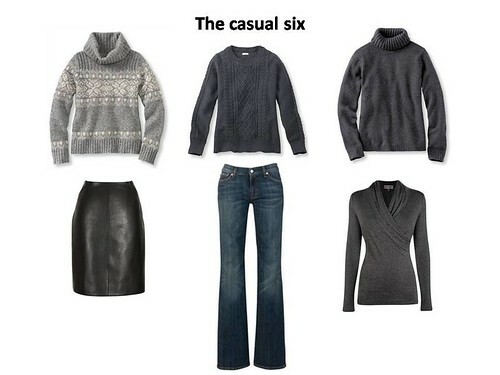 Or perhaps a better title would be “The Unintentional SWAP Wardrobe”. I didn’t start out sewing a SWAP (Sewing With A Plan). In fact, I started out without much of a plan at all. I just needed clothes. So I made some. And then some more. And then more still. Until I had more than enough to call it a SWAP. This year, the rules (on Stitcher’s Guild) called for sewing coordinating pods. I was really short on tops so my pods are one bottom and two tops, plus more tops in the combo pack. By some miracle, I hit upon the combination of a denim skirt with a short-sleeved top when I was sewing the 6-PAC. It was instant love and I started envisioning a closetful of colorful denim skirts, printed and solid-colored tops, and a few cardigans. So I had, well, if not a plan, at least a vision. 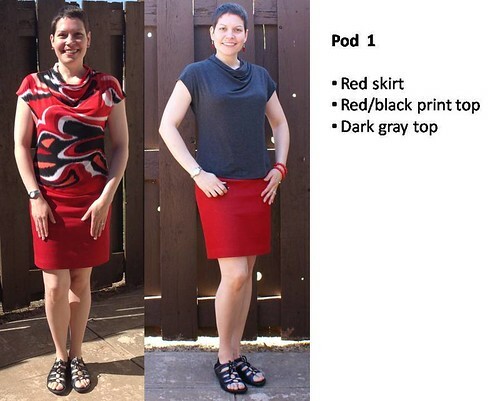 The combo pack is two garments that coordinate with both Pod 1 and Pod 2. Above and below you can see how this worked for my pieces. The wildcards could be just about anything but had to follow the pod rules. I stuck with one bottom and two tops. 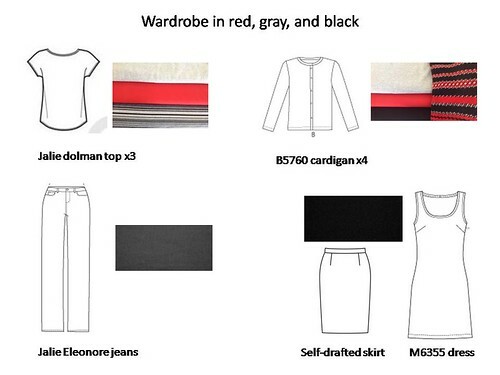 The black skirt works with every top and the multicolor print top works with both of the other skirts. 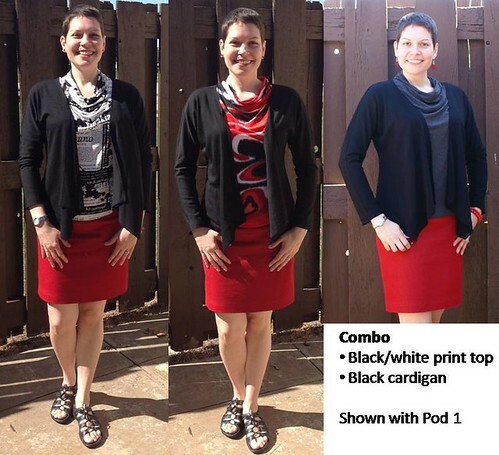 I’m not keen on combining the silver top with the other two skirts, but it works well with either cardigan. I think it would look great with a white denim skirt and together they may form the basis of the next 6-PAC. For an unplanned SWAP (ahem! ), this is quite a lovely collection, if I say so myself. I’m super excited! I haven’t been this productive in at least a decade, and the joy sewing has brought me in the last two months defies description. 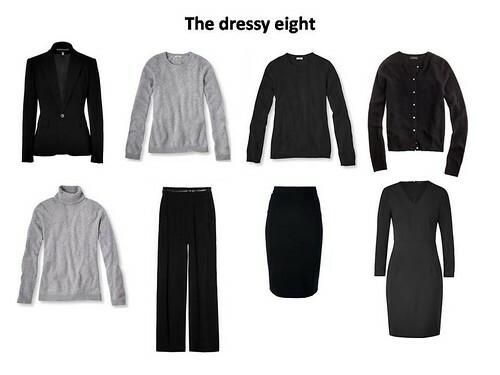 These clothes are very comfortable to wear and they are very me. I love them. 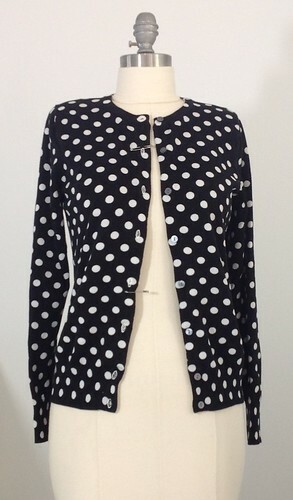 Oops, I completely spaced coming back here to tell you about the polka dot cardigan. Because I’ve been busy knitting and watching Craftsy classes. I even have a knitted FO for the next post. Which I will write right after this one so I won’t forget again. 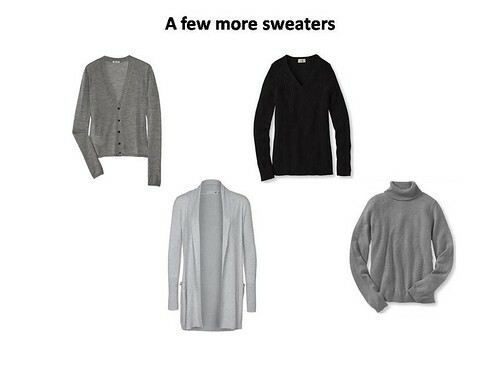 But back to the cardigan. 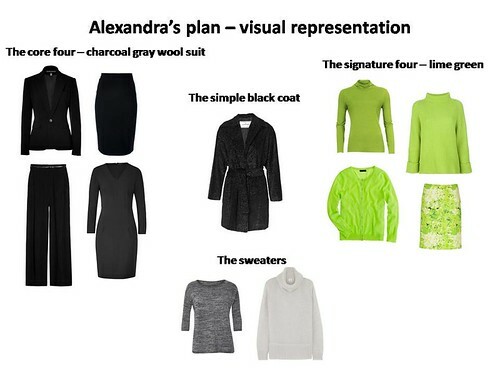 It’s a refashion project. 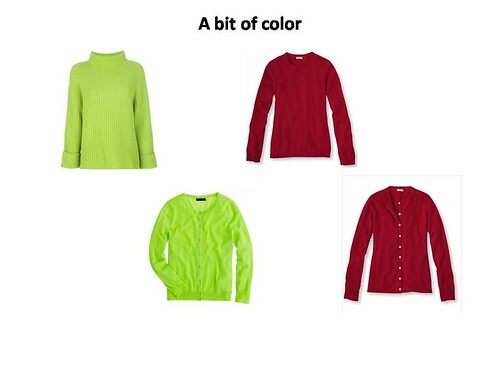 It started out as a nice, but really too long and rather shapeless cardigan from Lands’ End. I love the polka dots. The length is fixable. It was supposed to be part of my SWAP. Oh well. See what I mean? Too long. Bottom safety pin marks where I cut it off. I cut off some 7″ from the bottom so that it would end at my natural waist. Any longer than this and I would have had to take it in at the sides. This way I could leave the side seams untouched. I hemmed it using 1″ foldover elastic in black. I had also auditioned a slightly narrower white one, but it made the polka dots look ivory in comparison so that was a no-go. I also cut off the ribbing from the sleeves and finished them with the same 1″ black foldover elastic. This gave the sleeves a nice 3/4-ish length. I used the regular straight stitch – surprisingly, it has plenty of give. It’s not needed but it’s good to know it’s there. I’ve worn this cardigan quite a few times before the heat wave. It’s such a happy little shoulder warmer. Next up, I have a yellow knitted shawlette to show you. See you then! Occasionally over the years, I’ve planned a neat-looking SWAP and even made a few pieces, but I’ve never actually completed the whole thing (as far as I can remember, anyway). 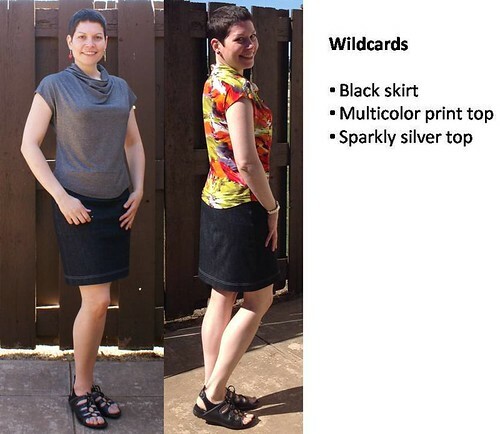 The closest I came was in in 2004, when I made three skirts and six/seven knit tops (seven sewn but one was a wadder). I have photographic evidence, hehe. This year, I need some basics. Simple shapes, easy color scheme, that kind of stuff. 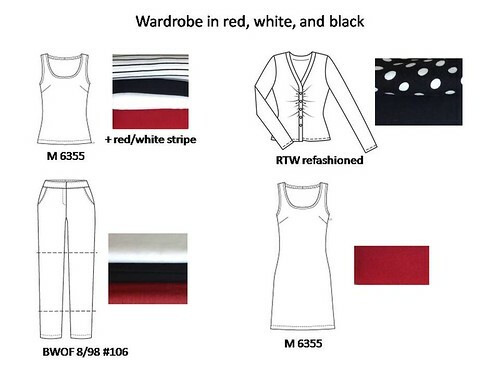 I’m going with red, white, and black. Most of them are already in my fabric collection. A little bit of analysis of my previous SWAP attempts leads me to believe that my best bet this year is to focus on one silhouette and make multiples of only a few patterns. 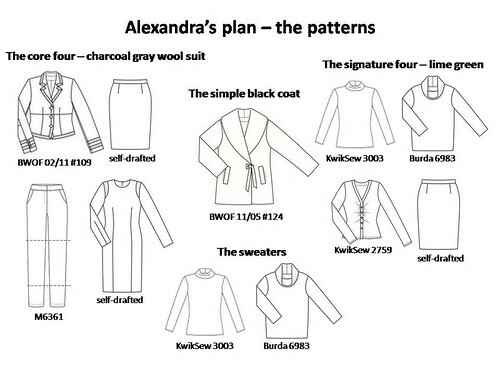 So, I’ll be making pants – it’s time to update my pant pattern to a narrower leg and adjust the length to somewhere near the ankle so they will work with both heels and flats. I’ll make three pairs: black, white, and red. 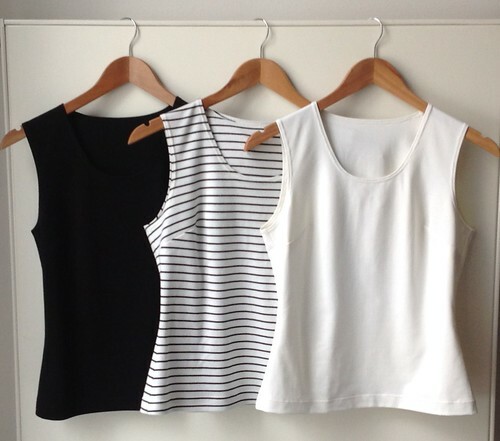 To go with the pants, I will make five tank tops: black, white, red, white/black stripe, and white/red stripe. I was completely wintered out by Christmas so all this sewing will be with spring and summer in mind. I am almost always cold so layering is important. That said, I do not like the feel of two sleeves inside one another so my preference is for a sleeveless top with a long-sleeved cardigan. The five tank tops should give me a pretty good start. The other three items in the SWAP are wildcards and those will be two cardigans and a dress. 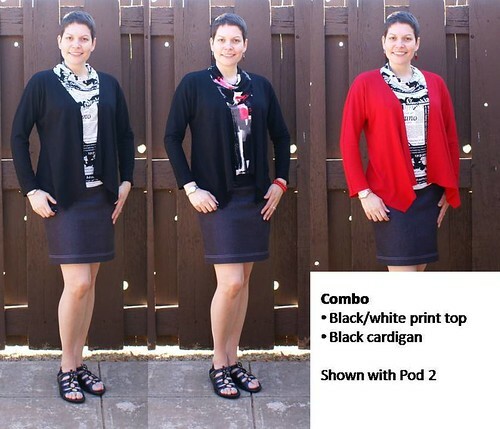 The two cardigans are RTW that need a little refashioning. One is solid black, the other black with white polka dots. 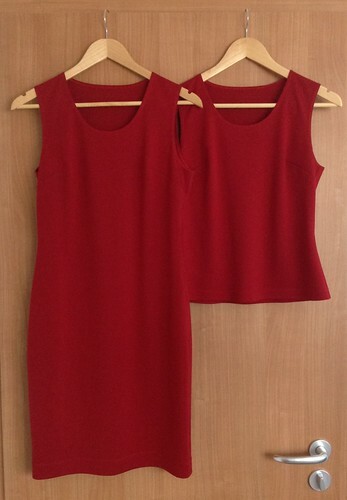 I plan to cut them shorter, reshape the neckline, and add white trim like I did on the red one. 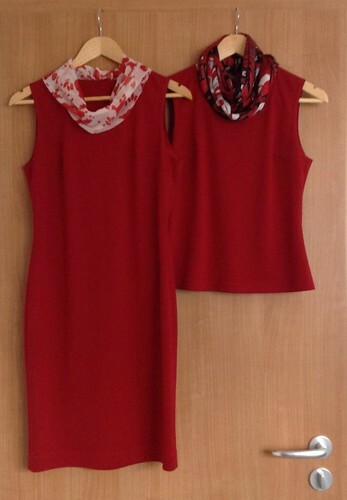 The dress will be solid red and sleeveless. I am actually going to limit myself to just two patterns – one for the pants and one for the tops and dress (both of these patterns are TNT). I am hoping this will help eliminate any analysis paralysis so that I can just sew. Let’s see how well it works.